To Take On A Hike? How can I bring enough lightweight, tasty food to keep my energy level high during a hike? 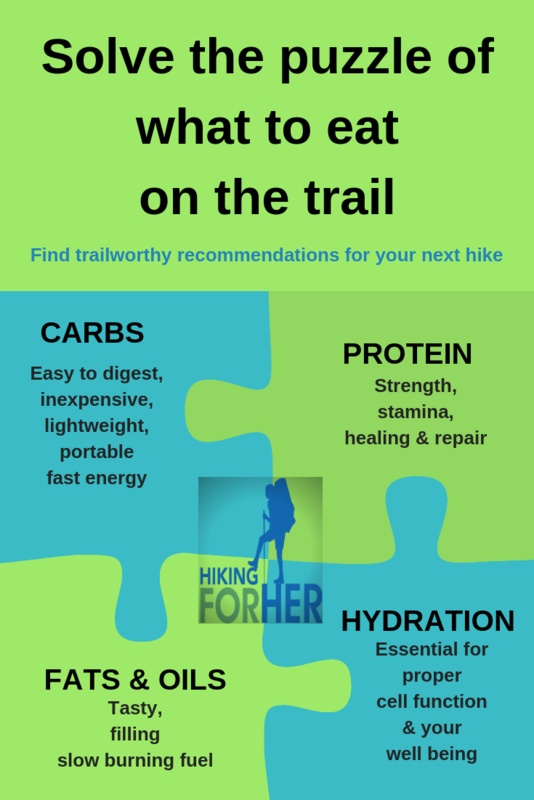 Because the best hiking food is so much more than just muscle fuel, there are several ways to go about selecting food for your next hike - lots of different ways to answer that burning question! Let's play around with a few of them! You never know which one will spice up your life, right? What kind of food is best to bring? Am I packing the right stuff? Should I eat normal portions, or is it ok to eat more? How many calories per trail snack make sense for my body? What are my options for lightweight dehydrated food? Will eating the same hiking food day after day harm me? Will carrying a pack help me lose weight if I cut back on hiking calories? What consequences will follow if I just give in to my huge trail appetite? Will heavy, calorie rich food like nut butters and cheese make me fat? 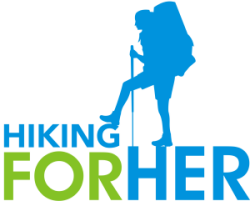 So let's look at Hiking For Her resources you can use to select the best foods for your backpacking trip or day hike. We'll use five different approaches. If you like to dip into something, take a small bite, and move on, start here with an overview of hiking nutrition. Or you can jump right into the fun stuff, like this: trail mix for energy! Have I got the goods for you, or what?? I have a background in human biology, meaning I've taken, and taught, lots of courses on how food molecules are broken down and used in the body (biochemistry). Interested in taking a little tour with me through the wonderful land of calories (hiking energy) from carbohydrates? No need to stand in line, just click here! Do you have the right mix of carbohydrates, fats and protein? Shake up your day hike and backpacking food habits! If you've been eating the same hiking snacks, hike after hike, maybe it's time to take a closer look at your options. This is especially true if you don't have the energy and stamina you want on the trail. And even more true if you don't know what to eat on a long hike. It's also mandatory if you feel sick, bloated, or foggy headed during a hike. It's possible that going gluten free will free you from these issues. If you're ready to try something completely different, consider the merits of seaweed hiking snacks. It's that time of life! What should I eat during menopause when I hike? A woman's body changes drastically during puberty - remember that whole hormonal chaos? And it changes drastically again during perimenopause and the subsequent years spent shutting down the female reproductive system. Not sure why they call it "pause", because it won't start up again! And it's quite a long pause at that! If you're nearing the age of 45, or are between 45 and 60 years old, these menopause hiking nutrition tips are for you! Post-menopausal hikers will appreciate these tips as well. 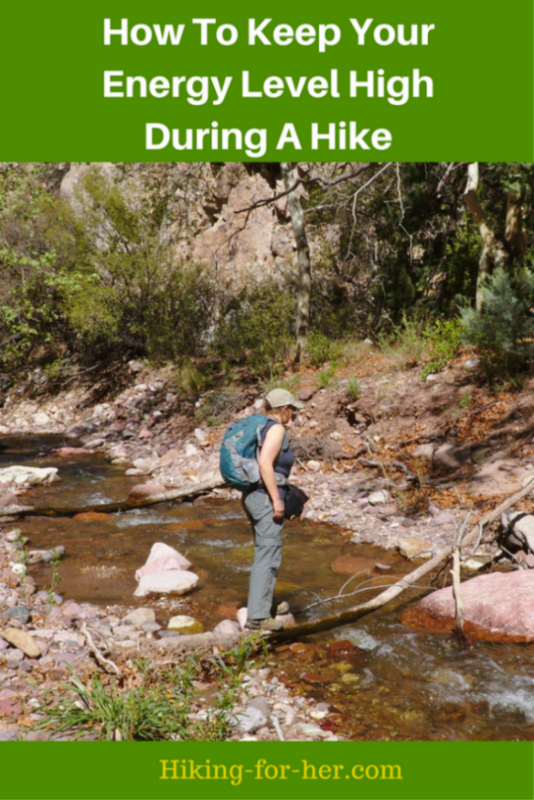 Examine something that most people are surprised to hear called a food nutrient: hiking water. Your hydration level is really important to your trail performance. Ignore it at your peril. And I include every female hiker in the "endurance athlete" category, regardless of how far or how hard you do/don't hike. Because if you move, you sweat and lose water through your open mouth. That makes water your best friend forever on the trail. Are you returning the compliment by drinking enough water? And checking your hydration status? I hope you enjoy clicking around all of the hiking nutrition information I've put together for you. If you're ready to get down to business, you might want to take a look at my Fast Facts nutrition booklets. They give you specific ideas, suggestions and tips for choosing the best food for your particular hiking needs.